The 24 karat gold coin series honoring the spouses of the Presidents of the United States will enter its fifth year. 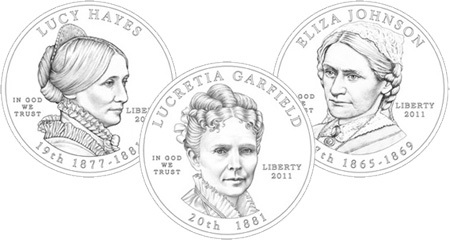 The 2011 First Spouse Gold Coins feature Eliza Johnson, Julia Grant, Lucy Hayes, and Lucretia Garfield. Following the format of the series thus far, the obverse of each coin will include a portrait of the First Lady and the reverse will present an image, which is representative of her accomplishments or major themes of her life. There was some controversy surrounding the designs of this year’s coins. When the Citizens Coinage Advisory Committee reviewed the design candidates provided by the United States Mint, they selected only two designs from a field of 55 candidates. The US Mint subsequently provided additional sets of designs for evaluation. After dropping for a number of years, sales levels for the First Spouse Gold Coins are showing signs of stabilization. When the series was first released it generated a tremendous amount of interest, which proved fleeting. After sales levels fell to historically low levels for some of the 2009 issues, the US Mint cut maximum production levels. For the 2010 issues, collectors ordered the coins in slightly higher quantities. Each coin is struck in one-half ounce of 24 karat gold and available in proof or uncirculated versions. The order of the release will follow the Presidential Dollar series, although the spouse coins have sometimes seen delays. The US Mint establishes maximum mintages for each issue at the beginning of the year, although these levels remain unknown. Pricing is dependent on the market price of gold. The initial prices are determined based on the prior week’s average gold price. Once the coins are available, pricing may be adjusted weekly following changes in the average price of gold.